The cortical evoked responses to sensory stimulation were studied in order to evaluate the central effects of oral tryptophan in normals and schizophrenics. In the first study, seven volunteer male students were tested during four experimental sessions. Visual evoked responses to flashes were recorded at occiput and vertex, before and 11/2 hours after the ingestion of 35 mg/kg tryptophan in apple purée with 50 g glucose or placebo. Some significant modifications of evoked responses were observed after tryptophan ingestion: a decrease of amplitude and an increase of variability. The latencies were rather stable, presenting only minor modifications. From these results, corroborated by some data from literature, it may be supposed that tryptophan induces a decrease of arousal. In the second study, seven chronic schizophrenics and 6 volunteer controls were tested, using an analogous experimental design, however with some modifications: the tryptophan dose was increased to 50 mg/kg and administered in 200 ml of milk, instead of apple purée with glucose. The modifications of evoked responses recorded in the preceding study were no longer found. 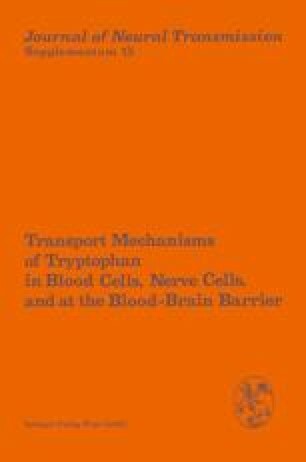 Probably, the substitution of milk for glucose resulted in an alteration of the transport of tryptophan across the bloodbrain barrier. The blood parameters were rather similar in the two studies; therefore, the central effects of tryptophan did not parallel its blood levels.